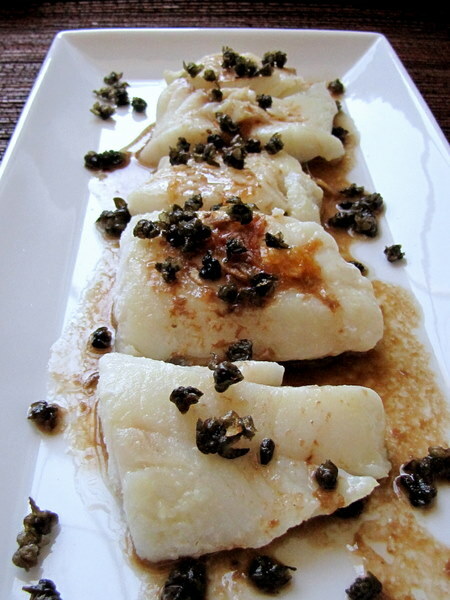 Cod in Sherry Wine Vinegar Caper Sauce ~ I Can Do That! It's Lent season and most probably every Food Friday entry will be a fish dish. Coat cod with 1 teaspoon salt and 2 tablespoons of olive oil. Bake in a 375° F oven for 10 - 15 minutes or until fish flakes easily with a fork. While cod is baking, prepare the sauce. In a skillet, heat 2 tablespoons oil and saute shallots until golden brown. Add vinegar, water, the remaining salt, and ground pepper. Cook for 2 minutes over low heat. Pour over cod. Sprinkle with capers. that looks delicious! elegant, too...more than one cup rice siguro makakain ko if that's the viand...lol. have a blessed and happy weekend! Another yummy dish ! Perfect for a Friday !